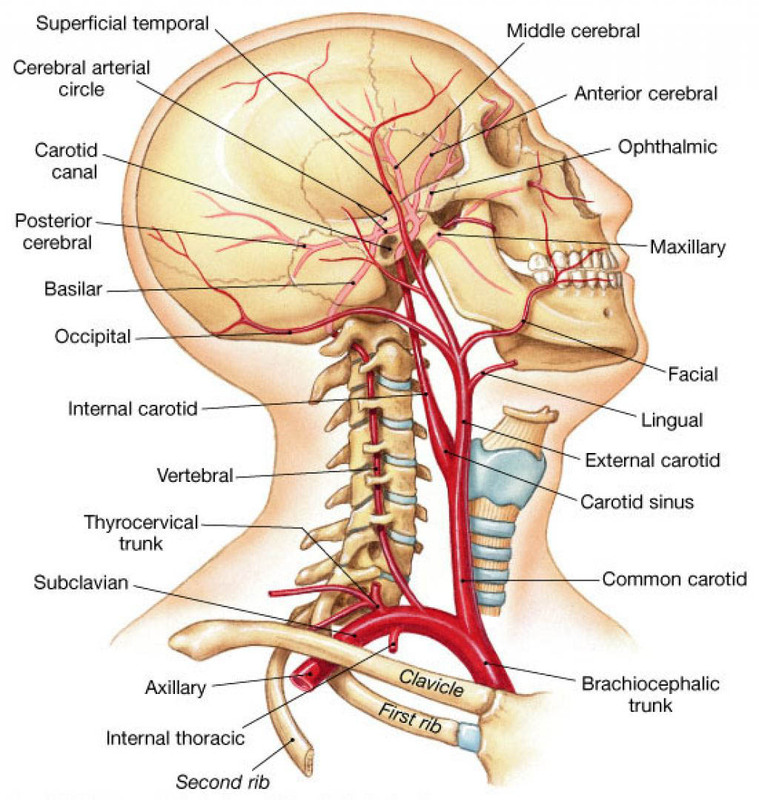 The external carotid artery flows upward on the side of the head to branch into various structures in the neck, face, jaw, scalp, and base of the skull. The main vessels that originate from this artery are: (1) the superior thyroid artery, to the hyoid bone, larynx, and thyroid gland; (2) the lingual artery, to the tongue, muscles of the tongue, and salivary glands below the tongue; (3) the facial artery, to the pharynx (throat), palate, chin, lips, and nose; (4) the occipital artery, to the scalp on the back of the skull and various muscles in the neck; and (5) the posterior auricular artery, to the ear and scalp over the ear. The external carotid artery terminates by division into the maxillary and superficial temporal arteries. The facial vein is a branch of the external carotid vein. It returns deoxygenated blood from the pharynx (throat), palate, chin, lips, and nose back to the heart. 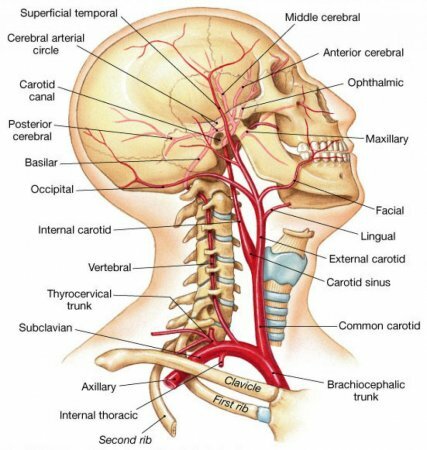 The internal carotid artery enters the skull and supplies the anterior part of the brain (via cerebral branches), the eye and its appendages, and sends branches to the forehead and nose. It has many curvatures in different parts of its path. When it passes through the carotid canal and the side of the body of the sphenoid bone, it has double curvature and looks like the italic letter S.
It moves up at a right angle to the pharynx and then towards the skull's base. At this point it will goes into the carotid canal, which is located in the temporal bone's petrous portion. The internal carotid artery rests on the external carotid artery's outer side at first and then it goes behind it. The internal carotid artery starts is in the superior carotid triangle and as it rises, it lays deeper, under the parotid gland, the digastric muscle's posterior belly, stylopharyngeus and stylohyoid muscles and styloid process. The posterior and occipital auricular arteries and the glossopharyngeal and hypoglossal nerves cross it. On the outside, it is close to the pneumogastric nerve and the internal jugular veins, and around the bottom of the skull with the hypoglossal, glossopharyngeal and spinal accessory nerve. From behind, it's near the superior ganglion of the sympathetic nerve, the superior laryngeal nerve, and the rectus capitis anticus major muscle. In an adult it is about the same size as the external carotid; however, in a child, it is larger than the vessel. Branches of the two internal carotids and the basilar artery join at the base of the brain to form a ring of blood vessels called the circle of Willis. The carotid arteries have two sensory regions in the neck: the carotid sinus and the carotid body. The carotid sinus is responsible for blood pressure and the carotid body watches the oxygen content of the blood and regulates breathing. The left external jugular vein, along with the right external jugular vein, drains into the subclavian veins. The external jugular vein passes over the sternocleidomastoid. It starts in the parotid gland. Where the retromandibular vein divides posteriorly and the posterior auricular vein connects with it, it forms the external jugular vein. This vein gets the majority of the blood from the cranium’s exterior and the face’s deeper portions. The left internal jugular vein is the left of two valves that make up the internal jugular veins on each side of the neck. This is the smaller of the two internal jugular veins. The internal jugular veins return deoxygenated blood from the head to the heart. The left internal jugular vein curves forward and joins the subclavian vein, and then crosses over the left common carotid artery at the neck’s root. The retromandibular vein is a tributary of the internal and external jugular veins, which run up the neck into the facial veins. The right external jugular vein has a somewhat direct line with the internal jugular veins, making it often easier to assess the pulse contour and the blood pressure in the thoracic vena cava (known as venous pressure). The parotid gland is where the external jugular vein starts. It’s formed where the posterior auricular vein and the retromandibular vein’s posterior separation meet. This vein gets the majority of the blood from the cranium’s exterior and the face’s deeper portions. The subclavian vein receives the external jugular vein’s drainage. The right jugular vein is on the right side of the neck. It returns the deoxygenated blood from the head to the heart. The left jugular vein lies deep inside the neck and is seldom injured. The vertebral artery is one of the main arteries at the base of the neck and is the first branch of the subclavian artery. It later unites to create the basilar artery in a complex named the vertebrobasilar system. This system provides important areas of the brain with blood. A plexus of nerve fibers surrounds the vertebral artery and the first part arises from the subclavian artery to the sixth cervical vertebra's transverse process. It goes to the upper six cervical vertebrae's transverse processes to the skull by going up into the foramina. It enters the skull by way of the foramen magnum, in front of the ligamentum denticulatum's uppermost tooth. Then above it turns between the hypoglossal nerve and below, the first cervical nerve, and continues to the medulla oblongata's anterior surface. It forms the basilar artery by uniting with the other side at the lower border of the pons. Here it becomes intracranial. The vertebral artery has two sets of branches: cervical and cranial. The neck is where the cervical branches are given off and the cranium is where the cranial branches are given off. The muscular and lateral spinal arteries are the cervical branches. The lateral spinal ones divide into two branches by way of the intervertebral foramina. These two branches supply the bodies of the vertebrae, the spinal cord, and its membranes. Before the vertebral artery hits the posterior ligament of the occipito-atloid the muscular branches are given off. These branches service the neck's deep muscles. The occipital and the ascending and deep cervical arteries merge with these branches.